To celebrate our second wedding anniversary on Sunday, we decided to unplug and spend the day outside. We packed lunch in our trusty yellow backpack (veggie wraps, granola bars, apples, chips, water), laced up our sneakers, and headed out for a fall hike and picnic in the reservation. We followed a different trail than usual, which turned out to be completely unpopulated for the better part of two hours. At one point, Tiho stopped because he was convinced he heard the tell-tale rattle of a snake nearby. I turned white as a sheet and promptly took off to "outrun the chance of a bite. "After several miles of hiking, we reached the scenic overlook and settled in for a picnic in the sun. "The trail can be a great teacher if we allow ourselves to reflect on the nature of our experience. In fact, the trail is a perfect metaphor for life itself. Like life, the trail has its forks in the road which present us with decision points, its obstacles that slow our journey and test our resolve, its ever-changing terrain which demands that we adapt, its inclines and descents which draw on different strengths, and its fellow travelers whose relationships enrich our experience. Sometimes the trail is hidden and worn, but it is always there waiting to be rediscovered. And, like life, the trail always leads somewhere. As we set aside our trail gear and resume our normal daily routines, the trail experience can easily translate into lessons that lead us to a better understanding of our lives lived each day." P.S. 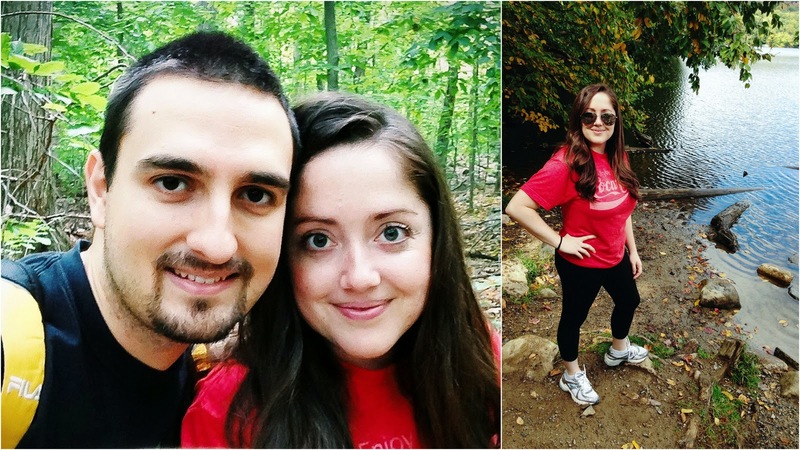 Hiking the reservation last fall: part one & part two. Oh, how I love this. Happy anniversary, you two.